Two weeks ago I received my long-awaited copy of a full-length recording of Lyric Stage’s production last year of The Golden Apple. And not long-awaited merely in the sense of my having wanted it since hearing last fall that it was coming, but long-awaited in the sense of my having craved a full-length recording ever since first learning about the show some thirty-odd years ago, back in my college days. This is the first complete recording of the greatest musical you’ve probably never heard of. It was a big hit off Broadway in 1954, then moved to Broadway and bombed, probably due to very poor promotion as much as anything. 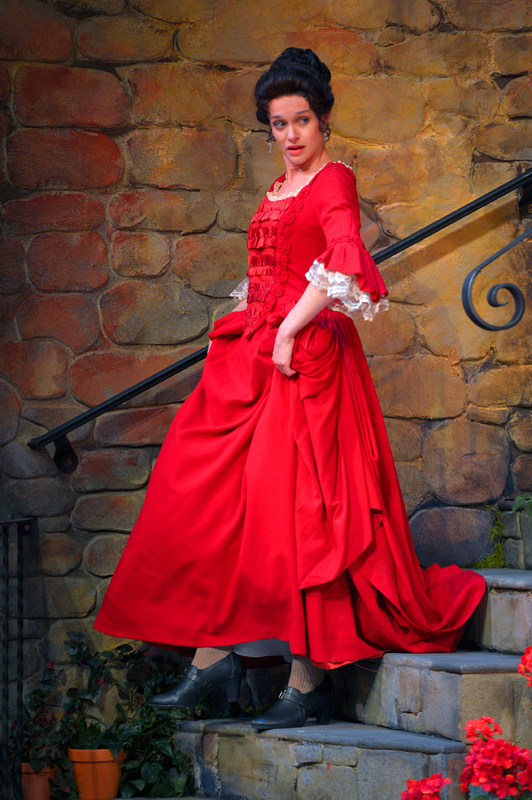 The show is fully sung, with no spoken dialogue, so the one-disc original cast album preserved less than half of the music and didn’t give much of a sense of the piece as a whole. The sound quality of the original cast album is also not all that good. But not long after coming across a used copy of the LP in the late 1970s, I also found a used copy of the libretto (which Random House had published) and I quickly got to love the show, or at least as much of it as I could get to know. It is insane that such a great musical has had to wait sixty years for a complete recording of good quality. This last couple of weeks, I’ve been feeling grateful to have lived long enough to listen to it. Despite being so little known, The Golden Apple seems to me to be one of the most influential musicals ever. You know the often-used (and much overused by now) device of writing the score to a musical as a pastiche of one or more distinctive popular styles that are in some way related to the period and/or setting of the story? Like the way Bernstein wove a series of pastiches of national musical styles into Candide to reflect Candide’s travels around the world? Like the way Sondheim wove a series of pastiches of bygone popular song styles into Follies? Like the way Kander and Ebb wove a series of pastiches of Kurt Weill-esque numbers into Cabaret? The Golden Apple did that first, and brilliantly. The recording is taken from live performance, rather than being recorded in a studio, so it isn’t always completely polished. However, the performers are terrific (the chorus is a little sketchy here and there) and they get it: they get the show, get their characters, get the words that they are singing. The orchestra sounds wonderful. The musical direction is intelligent and sympathetic, and the orchestra sounds very good. The Golden Apple is a retelling of the Iliad and the Odyssey in the style of American folklore and folk humor, as though the story took place in a small agricultural town in Washington state in the early 1900s. Helen is a farmer’s daughter, and Paris is a traveling salesman from the big city on the other side of the mountains. Minerva, Juno, and Aphrodite become the town’s most important and socially influential women — respectively the town librarian, wife of the town’s mayor, and wife of a general. Ulysses is a captain in the army, just back from the Spanish-American War. When Helen runs off with Paris, Ulysses leads his men to the big city to bring her back, and gets caught up in a series of big-city snares — Madame Calypso is a leader of society, Scylla and Charybis are tycoons manipulating the stock market, and so on. Most of the score is written with the flavor of American folk music (Moross was part of Copland’s circle, and his music has a similar feel to Copland’s — later, Moross would go to Hollywood and basically define for us all what Hollywood Western film music sounds like), but Ulysses’s mishaps in the big city are written as a series of vaudeville turns (in some cases based on actual vaudeville numbers, just as in Kander and Ebb’s score for Chicago, though as with Chicago, we are now so far from vaudeville that I’m sure not one person in a thousand nowadays gets any of the specific references). So there’s a sharp contrast in the second act, where suddenly the music sounds like you’ve slipped into a different show. I don’t know of any earlier musical that contained anything like this vaudeville sequence. And if it wasn’t a direct inspiration for the pastiche numbers in Candide (Latouche was the original lyricist for Candide, by the way) and the Loveland sequence in Follies, I will eat my laptop. After several listenings, I don’t think most of the performances on the new recording have quite the richness of those on the original cast recording. But they are very good all the same, and imbued with a deep understanding of who the characters are and what they want. A lot of care was taken, both by the singers and the musical director, to make sure the words were clear and meaningful. The quality of the recording is so much better than that of the original cast recording that I am hearing all sorts of details in the music that I hadn’t noticed before. The show, however, had the bad luck to be recorded by RCA, which was not focusing much attention on musicals at that point. If it had been recorded by Columbia, where Goddard Lieberson was a strong advocate for recording musicals, it probably would have gotten better treatment. But RCA was focused on classical music, and in fact in mid-March 1954 had begun experimenting with stereo. During the next few months, RCA recorded among other things Toscanini’s final two concerts with the NBC Symphony Orchestra, concerts by Reiner with the Chicago Symphony and by Munch with the Boston Symphony, and a studio performance of the Franck Symphony by Cantelli with the NBC Symphony Orchestra. Dave suspects, then, that RCA’s best sound engineers would have been working on the experimental stereo recordings during that period, and that RCA would have assigned a second-rank recording team to The Golden Apple. Last week Dave and I went back for a second look at the Aurora Theater’s production of Lanford Wilson’s Fifth of July, which we’d seen at a late preview and enjoyed. Wow. The performances have really deepened a lot, and the whole production is really engrossing. As Ken Talley, Jr., Craig Marker now has a stronger and more palpable sense of anger and frustration bubbling under the surface — he hadn’t really found it yet in the preview we saw — and it makes the story cohere better; Ken hides his despair under a surface of wry quips and indifference, but the more we can sense in the first act that this is a mask he uses to avoid dealing with painful but important issues, the more powerful the second act is when the painful issues start breaking out to the surface. The whole ensemble is very sharp. Elizabeth Benedict, playing Ken’s Aunt Sally, whose performance I thought was one of the best things about the preview performance, is if anything even stronger. And the rest of the cast is up there with her now. I was surprised at how much more I liked the play seeing it a second time after just a few weeks. I knew the play already when we saw the preview, but I hadn’t read it in many years; this time, seeing the first act again but with the second act clear in my memory from just a few weeks ago, I was startled to realize that I hadn’t ever noticed before how nicely written the first act is. It’s kind of amazing how much we learn about the characters and their situations and relationships in the course of what feels like a very loosely organized first act. A group of friends and family have come together to scatter the ashes of Uncle Matt, but Aunt Sally can’t decide if she’s really ready to scatter them. People dither about getting dressed, they change their minds about whether to go, they gossip about each other and rehash old issues (that they claim are all behind them, but of course they’re not), and by the end of the first act we know enough to care about these people and wonder how they are ever going to get past their old griefs and make new starts. It’s lovely playwriting. Last week Dave and I went to a preview for the Aurora Theater’s production of one of Dave’s favorite plays, Lanford Wilson’s Fifth of July. It’s a lovely production, and the acting was very good all around, though here and there it did feel just like a preview performance, with the characterizations sometimes a little roughly sketched in, still needing to deepen and fill in some details. We’re planning to go back later in the run and see how things have developed. One thing Dave loves about Fifth of July, which debuted in 1978, is that it may well be the first successful American play in which the central character is a gay man and yet the story is in no way about the fact that he’s gay. Being gay is just there, just another thing that particularizes him, like his hair color or his accent; if he were straight, the relationships and the story wouldn’t be hugely different. Wow, a play where people like us are just ordinary people, part of the fabric of the world, no big deal. What’s more important to the story is that he lost both legs in the Vietnam War and hobbles around on fiberglass prothenics and crutches, and that he’s given up on what he thought he was going to do next with his life, but he hasn’t told friends and family about this or come up with anything else to do instead. Meanwhile, his aunt still hasn’t gotten up the wherewithal to scatter her late husband’s ashes as he requested, even though it’s been several years since he passed away. It’s a good play about how life stalls out on us sometimes, and we have to figure out how to let go of our past hopes and find a way to move forward. We hope to get back for a second time. Dave and I just got back from a really wonderful production of Larry Shue’s farce The Foreigner at the Contra Costa Civic Theatre. I saw the first off-Broadway production starring Anthony Heald in the late 1980s, and I became an instant fan and saw it one or two more times (I forget now which). I’ve not seen it again till now, though I’ve reread it several times over the years with great pleasure; I don’t know why the play isn’t done all the time, but it isn’t. This production seems just as good to me as the off-Broadway production was, though of course it has its differences and is weaker in some ways and stronger in others. Ryan O’Donnell’s performance as Charlie, the phony “foreigner” of the title, is quite different from Heald’s (or at least my memory of it) but in some ways he’s even more convincing in the role than Heald was. That may be something of a backhanded compliment, as Charlie is such a total nebbish at the start of the play, but be that as it may, O’Donnell nails the nebbish and then nails every step of Charlie’s transformation. I thought Aaron Murphy as the slow-witted Ellard was the other standout — my memory may be weak but I don’t remember Ellard being played with so much detail and so much heart off-Broadway. But the whole ensemble is just really, really good. Larry Shue died young, not long after writing The Foreigner; had he lived, we wouldn’t be talking about how The Foreigner was his last play but about how it was the first play in which he’d really mastered his craft. It’s an intricate farce, the sort of comedy where you spend the first twenty minutes being shown dozens of assorted bits and pieces of story and character, and then you spend the rest of the play gasping with delight and disbelief as the playwright takes this assortment of gears and pulleys and ratchets and puts them together to make an astonishingly tricky and hilarious clockwork machine. And yet in this play Shue also created a number of genuinely memorable characters who don’t feel mechanical at all, some of whom you even come to like and care about, even as you’re laughing at the impossible tangle they’re getting themselves into — or at least I do. I’m a big fan of Shue’s earlier farce, The Nerd, too, but in that one the characters never really stop feeling like the playwright’s puppets; The Foreigner has a heart and soul that The Nerd doesn’t. It’s a huge shame and a great loss to us all that, once he had brought himself to this level of mastery of the craft, having at last found his way to a distinctive and confident voice as a playwright, this is the only play that Shue then had time to give us. Really fine production of one of the best farces I know. Definitely worth a visit. Gok! Gok! Blasny blasny! The Mercury News reviewer generally likes Center REP’s Mirandolina a lot, but she calls it a “door-slamming farce” and says that it never quite achieves the “fever pitch” she thinks it needs. Alas, Goldoni, the great Venetian playwright famed for “Servant of Two Masters,” is sometimes funnier on the page than the stage. 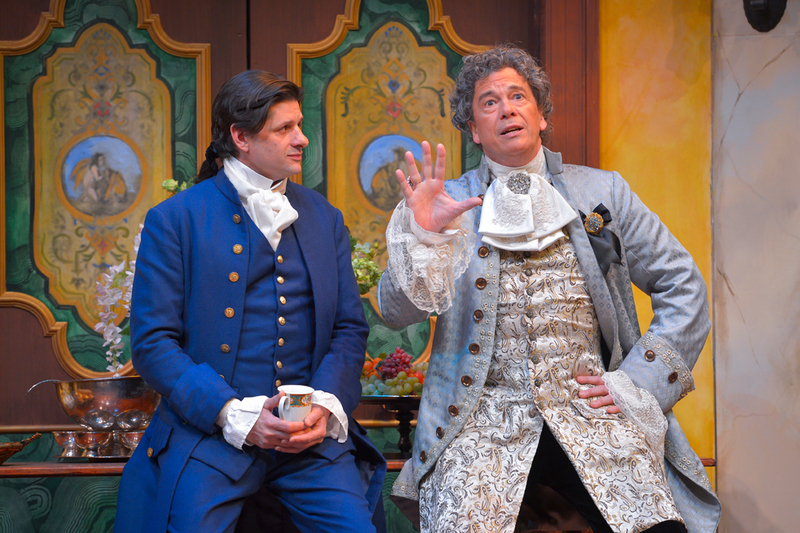 Near, former head of San Jose Repertory Theatre, directs with a light touch, but the first act lacks pep, and the last act needs more of a breakneck pace to make the farce pop. A little more speed would give the zaniness more zip. I think she’s right in thinking — despite the excellent production — that the play itself comes across as a bit thin, especially for a play widely regarded as one of the great masterpieces in Italian theater. But I think she’s wrong in assessing why; she thinks the production isn’t zany enough, but I think the problem is really that the play loses some of its character in translation. 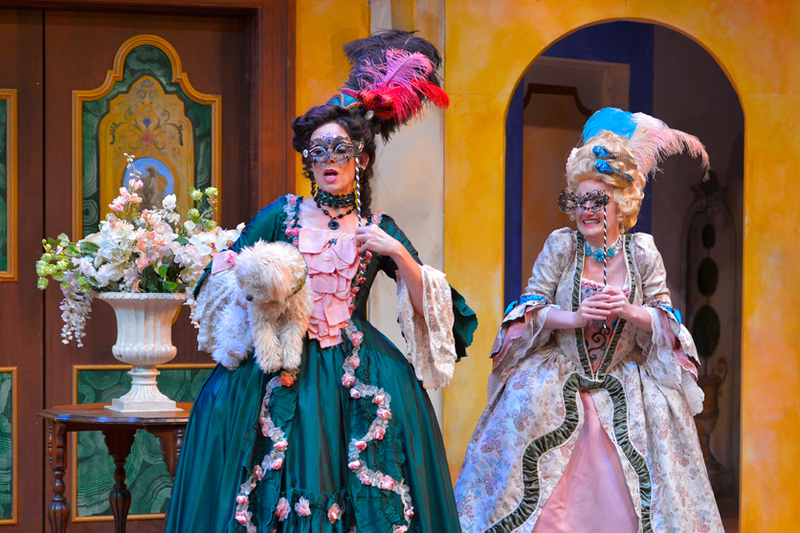 Goldoni’s play is more of a comedy of manners than a farce. Goldoni was writing in reaction to the commedia dell’arte of his time, which had become tired and formulaic, repeating the same slapstick gags over and over. On the one hand, Molière breathed new life into commedia dell’arte by taking its small-town character types and making them grander and more important, using comedy as a way of mocking and satirizing what he saw as important evils of society. Goldoni went in the other direction, keeping his characters at a more human scale, but drawing them less like cartoon characters and more like real people. But for that to work for us, we have to perceive the humanity in them, not just see them as stock characters in a zany farce. 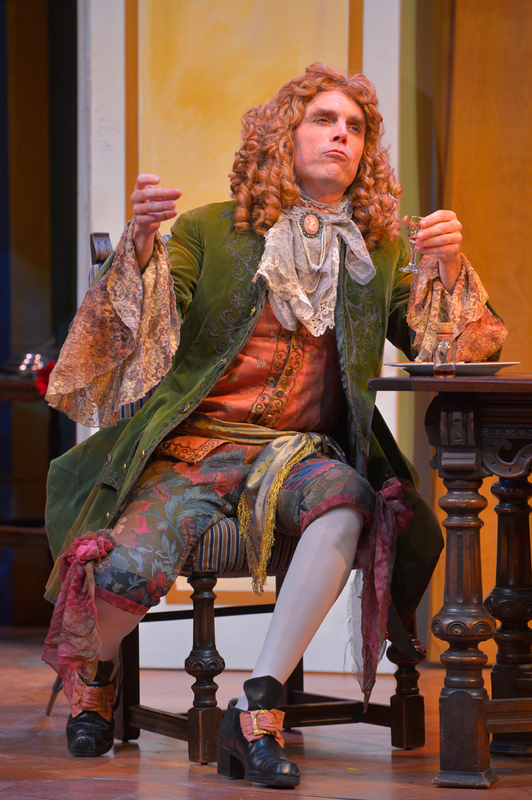 Molière’s larger-than-life characters transcend cultural borders more easily — Tartuffe and Orgon and Harpagon and Arnolphe are larger-than-life social monsters whom we can recognize in our own society even if the details of 18th-century Paris society are a mystery to us. But Goldini’s more human-sized characters — innkeepers, servants, merchants, rural nobility — are woven into the fabric of 18th-century Tuscan and Venetian society, and Goldoni took it for granted that his audiences would be familiar with their quirks and foibles simply from living among people like them every day. These characters tend to seem remote to us today, and they have concerns that can seem more artificial than real to us. So it’s hard to bring them to life in a way a modern American audience can understand and connect with. One way to accomplish that might be to rewrite the plays a bit. 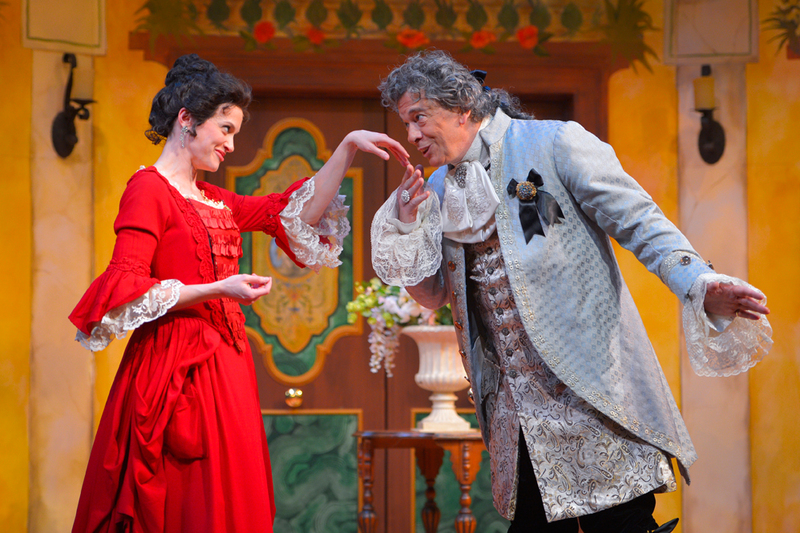 Goldoni’s best-known play in English, for example, is The Servant of Two Masters, but it’s most often done in versions that are more freely adapted, tightening the story and broadening the farce. Center REP’s version does a bit of this: The long, hilarious swordfight in the second act, for example, is an interpolation; in the play as written, the fight is interrupted almost as soon as it begins. Another tactic is to move a play from 18th-century Italy to more modern times. A popular version of The Servant of Two Masters in English, for example, moves the action to London in the 1960s. I did this sort of thing myself (though not with a Goldoni play) with The Riot Grrrl on Mars by “translating” the characters and situations to modern equivalents that the audience would recognize more readily and with less need for explanation of the cultural assumptions being made along the way. The original opera, L’Italiana in Algeri, has a story straight out of the commedia dell’arte in which a young, determined Italian woman journeys to Africa to rescue her lover, who has been kidnapped by pirates on the Mediterranean, from the Bey of Algiers; in The Riot Grrrl on Mars, a young, determined punk rocker flies to outer space to rescue her boyfriend, who has been abducted by a UFO, from the King of Mars. 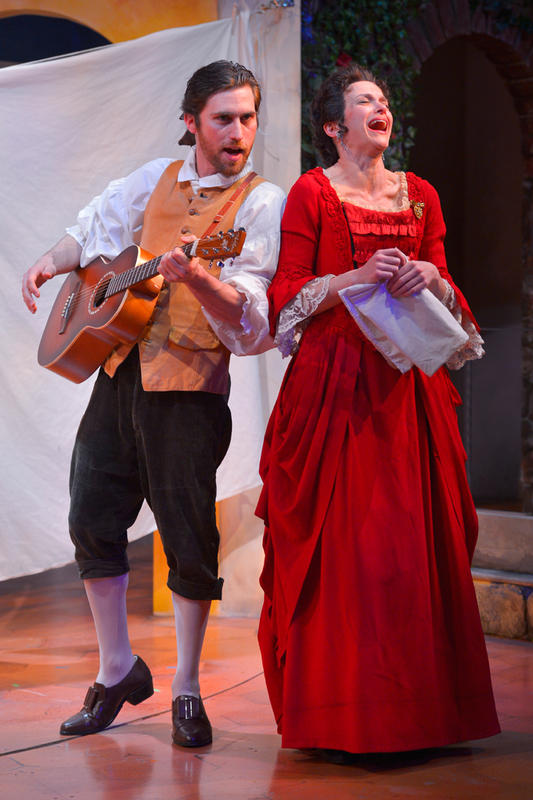 Center REP’s Mirandolina tightens the dialogue a bit, updates the rather formal Italian to breezy modern English, and adds a few songs and that splendid swordfight, but even so, it mostly stays close to Goldoni’s story and characters. That gives us a more direct view into Goldoni’s play, which is a good thing, but it can also make situations and characters seem quaint to us, which is not so good. 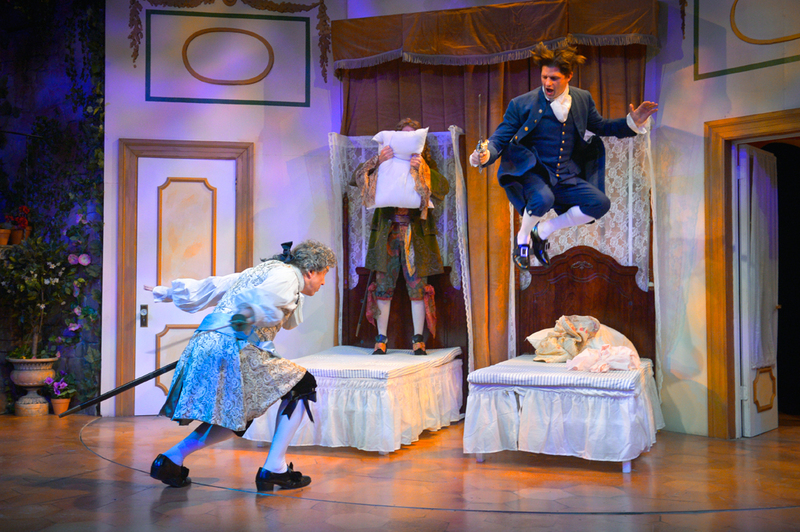 We American playgoers have to stretch a little harder to see the humanity that is shared between Goldoni’s world and our own. A worthwhile stretch to make, all the same. Dave and I went to Walnut Creek Saturday for a preview performance of Center REP’s new production of Mirandolina! Mistress of a Tuscan Inn, an English-language version of the 18th-century Italian comedy La locandiera by Carlo Goldoni. We had a great time, and we’re planning to go back for a second look later in the run. It’s a terrific production. The characters are strongly and strikingly portrayed by the excellent ensemble, headed by Tracy Hazas (who I don’t recall having seen before) as Mirandolina, an innkeeper who unwisely keeps the man she truly loves at arm’s length, partly because she’s too busy managing her inn, but mostly because two of her regular guests are smitten with her, and as they are both important men, she wants to keep their patronage by not dashing their hopes. One is a sour and haughty nobleman by birth who is constantly borrowing money to live on (played by Mark Anderson Phillips, who I think we last saw playing Oscar Wilde and an assortment of other roles in Mark Jackson’s Salomania! a few years back); the other is a brash, wealthy merchant who has recently purchased the title of count for himself (played by Michael Butler, in a more flamboyant role than I think we’ve seen him in before). The rivalry between the Count and the Marchese, each trying to one-up the other in front of Mirandolina, works to Mirandolina’s benefit — particularly when the men compete in giving her expensive gifts. A third man comes to the inn, a misogynistic cavalier (Gabriel Marin, a longtime favorite). Mirandolina is angered by his disdain for women and decides she’s going to use her wiles to make him fall in love with her. At this point it’s easy to be reminded of Much Ado About Nothing, but the situation is different — and morally dicier — because Mirandolina does not actually love the cavalier, but is seducing him only to get revenge for her wounded pride. Meanwhile, the man she really loves, her butler Fabrizio (Ben Euphrat), waits on the sidelines with growing frustration. A couple of touring actresses having a lark between stops (Lynda DiVito and Lizzie O’Hara), wearing theatrical costumes and pretending to be noblewomen, add to the complications. All this is played out on a wonderful, brightly colored set (by Nina Ball) that revolves to show the various locations in and around the inn. A swordfight that staggers from room to room as the set keeps spinning is a high point of the second act. Goldoni’s comedies seem to be hard to pull off in English. I’ve read or seen six or seven, and in all of them his dramatic construction is loose, in the commedia dell’arte style; he evidently meant his performers to have a certain amount of room for improvising and bringing their own personalities with them — indeed, in 18th-century Italy, if his plays hadn’t provided those opportunities, the best performers wouldn’t have wanted to do them. That makes the plays a challenge to do in a different time and place where commedia is not part of the culture. And then the plays are gentler and warmer than, say, the similar comedies of Molière and Gozzi, whose sharper, more satirical caricatures travel better across cultural borders. Goldoni poked affectionate fun at the manners, society, and even the dialects of Tuscany and Venice, and those things don’t mean much to us Americans. This adaptation doesn’t really find ways of bringing those aspects of the play to life, I think, and as a result the play itself comes across feeling like a thinner and more conventional farce than it really is. But Timothy Near’s direction is sure-handed and most importantly the cast is strong, so it all works anyway. Lots of fun. We’re going back. Hoo boy! I’m a sound engineer! After several years of procrastination, I actually set up our as-yet-unused-other-than-for-gathering-dust USB turntable, learned enough about Audacity to import the audio from one of my old LPs into my laptop, divide it into tracks, add fade-outs and silences at the ends of the tracks, and export it all into WAV files that I can then import into iTunes and thence onto my smartphone. Listening to the result through earbuds now — sounds pretty good. I picked the original cast album of the little-known 1964 musical Fade Out-Fade In to work on first. It’s not a great favorite of mine by any means, but it’s fun for a listen now and then, and I don’t have it on CD. Hopefully this will be the start of transferring a lot of my old LPs into digital format. Fade Out-Fade In was a spoof of the early days of Hollywood, tailored for the particular talents of Carol Burnett, who was just becoming a Broadway star and hadn’t yet abandoned stage for television. (That she did precisely that so soon after opening night resulted in a threatened breath-of-contract suit and is probably why the musical isn’t all that well known, but that’s a whole other story.) Many of the lyrics, which are by Comden & Green, are too facile and jokey by half for my liking, and others (such as that for the title song) seem bland and generic to me, but there are a few gems, including a Shirley Temple parody called “You Mustn’t Be Discouraged” and a mock femme-fatale number titled “Call Me Savage”. Some of the music, which is by Jule Styne, is really good, especially if you stop paying attention to the words. (Some of the songs, though, are just Styne writing deliberately corny period numbers, as he did quite a bit — I tend to think of this as his “vo-do-de-oh mode” — granted, he was terrific at it, but a little of it goes a lot way for me, and in some Styne scores, including this one, there’s quite a lot of it.) A song for the egotistical leading man (played by Jack Cassidy), called “My Fortune Is My Face”, has got some of the strangest chromatic harmonies Styne ever put into a song. (It has one of the show’s funniest lyrics, too, IMHO.) “I’m With You” is meant to be a parody of the cheesy, overblown Hollywood ballad, but it seems to me it would be a darned good song if it had less cheesy lyrics. “My Heart Is Like a Violin” is an even more exaggeratedly romantic ballad, with an even cheesier lyric and a big, overblown orchestration to boot, but I find it a really appealingly quirky tune all the same.